I Was In Love With a Short Man Once is a story collection written from the perspective of a crazy southern Irish gal. Follow her as she reflects on: growing up as a child of limited means in South Florida; managing a self-financed college education; balancing work as a federal official with the joys of single motherhood; and navigating the amusing challenges of being a second-time-around wife. Have you ever wondered if the life of the woman standing next to you in the check-out line is as weird as yours? Could it be possible that you are trapped in a bizarre reality show, where the object of the game is to get the crazy lady to flip-out just one more time? If so, then this book confirms that you are in good company. 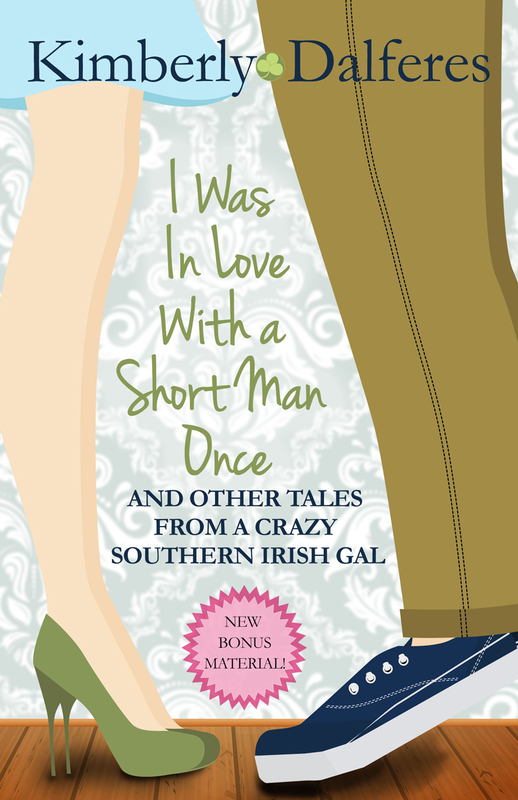 I Was In Love With a Short Man Once is a story collection written from the perspective of a crazy southern Irish gal. Follow her as she reflects on growing up as a child of limited means in South Florida; managing a self-financed college education; balancing work as a federal official with the joys of single motherhood; and navigating the amusing challenges of being a second-time-around wife. · Jimmy Stories illustrate the bond between mother and son. Stories here include “Kool-aid Mom” and “Zamboni” and reveal the life lessons that our children teach us. “As a fellow humor writer, I’m always looking for writers that make me laugh out loud. Kim Dalferes not only cracks me up, she’s been responsible for several snorts and one Kindle covered with the Diet Coke I spit out when I burst out laughing. Seriously, this chick is FUNNY. I found myself nodding and laughing out loud time after time. Do yourself a favor and GET THIS BOOK.” Vikki Claflin, Author, Shake, Rattle, & Roll With It. 5 *’s from Grady Harp – Amazon Hall of Fame Reviewer. This is one funny lady with a very fine talent whose bound to climb onto the platform with Erma Bombeck, Fannie Flagg, Nora Ephron et al. Catch her while she is wet! From Betsy Ashton – author of Mad Max, Unintended Consequences. Dalferes is a fresh voice in the realm of funny women who write about their own experiences…With chapter titles like “The Patron Saint of Parking,” “My Water Broke Because I was Married To a Prick,” and “Kool-Aid Mom,” everyone will find something to like. “Some of her adventures were so funny that I was laughing aloud …this book should come with a big warning: “Don’t read this in public.” Library Cat’s 5* review. “By the time I got to the end, (which I hated that it came so quickly) I felt like I was reading an old friends book. Kimba, add me to your bail you out or be in the jail cell with you group, you are my kind of people!” Read more of Barbara Ensign’s review here. I reside in a family of the uber-competitive. My husband has twice captured the largest fish trophy during the annual fishing trip. Dad is the best golfer, Step-Mom is the best baker (seriously, best homemade apple pie on the planet), and brother Scotty is hands-down the best story and joke teller.